A new strain of the old “blood libel” has recently emerged in Poland, where an influential right-wing journalist has accused Jews of murdering Polish children and plotting to take over the country. Mainstream Polish Catholics overwhelmingly reject such extreme views, but anti-Semitism continues to find support within certain factions of the Church. On other occasions, we find a more subtle blurring of historical truth, as in the sloppy use of the phrase “Polish death camps.” Such distortions and generalizations are clearly slanderous, and those who know better should vigorously defend Poles and Poland against them. At the same time, this does not mean ignoring the problem of anti-Semitism where it genuinely rears its head. Poland has never been “an anti-Semitic country,” but diverse anti-Semitic views have undoubtedly existed among Poles. In contemporary Poland, such views are increasingly marginal. Unlike in Hungary, they find no supporters in the parliament (there is no evidence to suggest that the recent ban on ritual slaughter in Poland was anything other than an animal rights issue). The mainstream media are actively hostile to any hint of anti-Semitic sentiment. Nevertheless, like every other country in the world, Poland still has its pockets of cultural and racial intolerance. In fact, we find clear evidence of what I would describe as a “thick anti-Semitic fringe.” By this term, I mean to imply that anti-Semitic ideology largely finds no place within mainstream cultural and political discussion in Poland, while still attracting enough support to make it more than a merely negligible phenomenon. In other words, it is marginal, but still significant. For instance, the conservative Catholic movement centered on Father Tadeusz Rydzyk’s extensive network of media outlets – which includes TRWAM Television, Radio Maryja and the Nasz Dziennik (Our Daily) newspaper – has provided a broad platform for various species of anti-Semitic rhetoric. In doing so, the movement has chosen to ignore Pope John Paul II’s repeated injunctions against such prejudice. In what follows, I shall outline an imaginative new conspiracy theory concocted by an influential Polish right-wing journalist, Stanisław Michalkiewicz, who continues to find a forum for his anti-Semitic ideas on Father Rydzyk’s media outlets and elsewhere. In recent times, Michalkiewicz has noticeably ramped up his rhetoric. No longer do we merely find the familiar litany of accusations about the “Holocaust industry,” “anti-Polonism” or “Jewish plunder” in the form of restitution claims. Instead, the conservative columnist has enriched his paranoia with a particularly malevolent theory linking fears of the restitution of Jewish property with the question of abortion. On the basis of this puzzling connection, Michalkiewicz has forged an innovative new adaptation of the old “blood libel,” while simultaneously developing a grander and more terrifying vision of a Jewish plot against Poland. Stanisław Michalkiewicz (born 1947 in Lublin) is a lawyer and journalist by education. During the communist period, he was an active member of the democratic opposition, collaborating with the underground press and associating himself with liberal conservative circles. After independence, he became a leading figure in the conservative Real Politics Union, together with Janusz Korwin-Mikke, who now leads the newly-formed Congress of the New Right. Michalkiewicz’s successive attempts to enter the Polish Sejm, the Senate and the European Parliament all proved unsuccessful, though he served on the Polish State Tribunal. Subsequently, his career as a conservative opinion writer took off. Today, members of various right-wing circles regard him as something of a guru, while he earns regular praise for his “light pen” (lekkie pióro, in Polish), or effortless style. Michalkiewicz has long been notorious for his so-called “Judeo-skepticism.” In 2006, Marek Edelman, a prominent participant and survivor of the Warsaw Ghetto Uprising against the Nazis, demanded – to no avail – that the government do something about Michalkiewicz and other blatantly anti-Semitic members of the Radio Maryja family. Since then, Michalkiewicz’s rhetoric has only become more extreme. 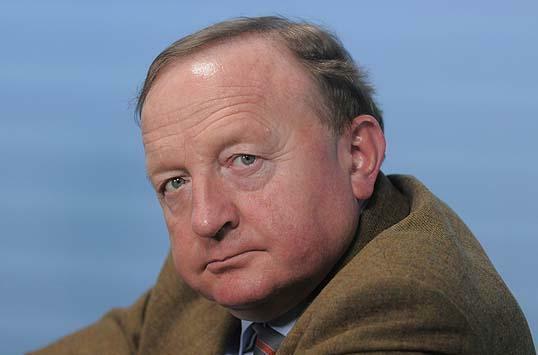 In January this year, the right-leaning Catholic magazine Fronda felt obliged to announce that it would no longer reprint Michalkiewicz’s opinion pieces on its website, after he made a mysterious reference to the “temporarily closed Auschwitz death camp” in protest against the Israeli Knesset’s visit on the sixty-ninth anniversary of the camp’s liberation. Michalkiewicz later clarified his statement, explaining that he had been referring to an alleged left-wing plot “to imprison anti-Semites and the opponents of genderism at Auschwitz.” Yet these bizarre claims are only the beginning. So the Jews want to rob Poland of its treasures and kill Polish children. Here we confront the arguments of classical, almost medieval anti-Semitism of the worst kind. 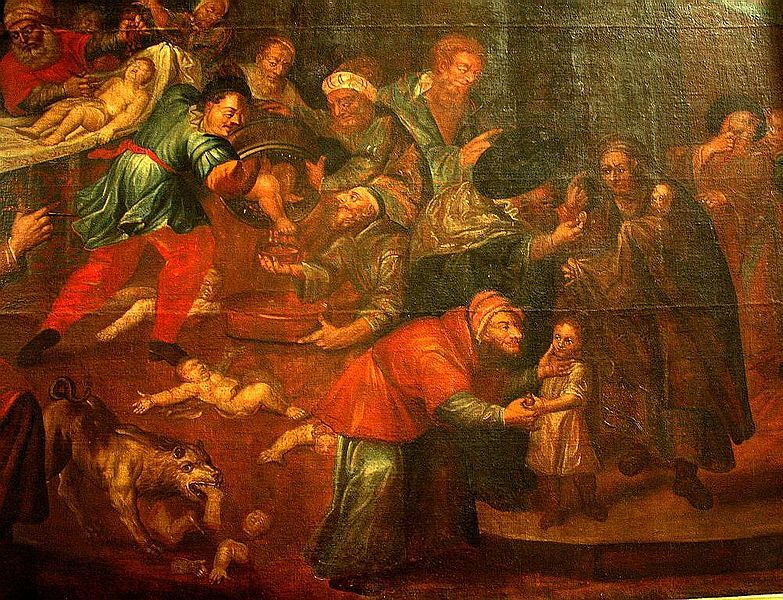 In fact, we find ourselves dealing with a peculiar new version of the old accusations of ritual murder, which were based on the false belief that religious Jews craved the blood of Christian children for ritual use. This legend has a long and baleful history in Poland – and indeed in several other European countries. Even after the Second World War the pogroms in Krakow and Kielce had their beginnings in groundless rumors about the ritual murder of a Christian child by local Jews. Michalkiewicz updates and secularizes this myth by linking the alleged murder of Polish children with geopolitical and economic motivations rather than with religious ritual. The Jews will create their “Lebensraum” (the conscious choice of this Nazi term is typical of the author’s perverse style) on the blood of Polish innocents. In his earlier article, Michalkiewicz even speculates that “from the point of view of Lebensraum the killing of already born people might also be completely rational, just like making soap from their remains.” Perhaps this is what Michalkiewicz really had in mind with his strange words about the “temporarily closed Auschwitz death camp,” which he wrote in protest against the Knesset’s impending visit in January. The Jews ultimately plan to exterminate the Poles at Auschwitz just as the Nazis planned to exterminate the Jews. 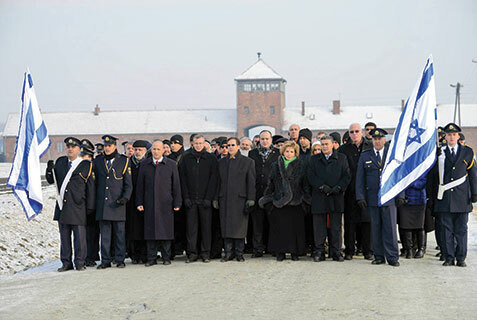 Members of the Israeli Knesset at Auschwitz-Birkenau, 27 January 2014. In effect, Stanisław Michalkiewicz has forged a modern theory that unifies three strands of traditional anti-Semitism: the blood libel, the myth of a secret Jewish plot against Poland’s interests, and economic anti-Semitism based on fears about Jewish control of property. In a less serious context, the paranoid fantasy that emerges from this meta-conspiracy theory – without the least scrap of evidence – would be almost amusing in its imaginative gusto. But in this case there is little room for levity. Michalkiewicz’s ideas are distinctly dangerous. They touch on the most essential and emotional subjects – the Polish soil and the lives of Polish children. They concern the very existence of the Polish state and the Polish people. Stanisław Michalkiewicz’s new blood libel is dangerous because its aim is to evoke the most extreme fear and hatred – neither of which were in short supply in the radical right-wing climate of ugly insinuations surrounding the recent visit of Israeli politicians on the anniversary of the liberation of Auschwitz-Birkenau. Of course, for the vast majority of Catholic and non-Catholic Poles such views are repulsive – as we may observe from the swift (though long overdue) reaction of the Fronda Catholic website to Michalkiewicz’s words about the Auschwitz camp. To this extent, Michalkiewicz is an increasingly marginal figure on the Polish ideological scene. However, the margin is still relatively substantial – constituting what I have described as a “thick anti-Semitic fringe.” The controversial opinion writer still enjoys strong support from right-wing and nationalist Catholic circles. Nasz Dziennik – which is not entirely a marginal publication – regularly prints his texts. He also appears frequently on the affiliated Catholic media of TRWAM Television and Radio Maryja. Given the Catholic Church’s clear position on the unacceptable nature of anti-Semitic prejudice, it is difficult to understand how this can still be the case. In recent months, the Church has been on an ideological offensive in Poland. In December, the Polish bishops launched a strongly-worded attack on the so-called philosophy of “gender” in a pastoral letter to be read in churches throughout the country. In this letter, they urged Catholics to oppose any dissemination of this harmful “ideology,” pointing to its supposedly destructive consequences for family and social life. Evidently, the bishops have not shied away from making public stands on moral issues. Surely it is high time they made their position similarly clear on the radical anti-Semitic views that continue to find a platform in prominent Catholic media and institutions. At the instigation of Pope John Paul II, the bishops spoke out against anti-Semitism in Poland immediately after the fall of communism. Now it is time to tackle the issue within organizations affiliated with the Church itself. Why have they failed to do so? The sad answer to this question may be that some of the present Polish bishops ultimately share Father Rydzyk’s indulgent attitude to anti-Semitic excesses. If so, they must bear partial responsibility for the creation of a new blood libel in twenty-first-century Poland.